The RevoLix DUO combines a 120 watt Thulium wavelength with a 20 watt holmium making it the perfect laser for Urological use. The Revolix and Sphinx systems combined in one package. The Thulium wavelength provides fast vaporisation of soft tissue. The thulium wavelength can be utilised for Vaporesction (ThuVARP), Vaporisation (ThuVAP), enucleation (ThuLEP) and VapoEnucleation (ThuVEP) of the prostate maintaining excellent haemostasis. The Holmium 20 watt allows the same device to be used for kidney stones fragmentation and dusting. RevoLix DUO is the first universal laser in urology for lithotripsy, BPH, endoscopic, laparoscopic and open surgery. This versatility is achieved by combining a pulsed Holmium laser with a continuous wave Thulium laser in a single laser unit. RevoLix Thulium laser shows outstanding tissue ablation rate, hemostasis and economics for the application in urology. Surgical protocols for the treatment of BPH include vaporization (ThuVAP), vaporesection (ThuVARP), enucleation (ThuLEP) and vapoenucleation (ThuVEP) of prostate – histology available. Additional applications are in gynaecology, neurosurgery*, ENT and pneumology. Lithotripsy in the lower, medial and upper tract with rigid and flexible instruments is managed with the integrated Holmium laser. Stone dusting and fragmentation is highly efficient and irrespective of the chemical stone composition. 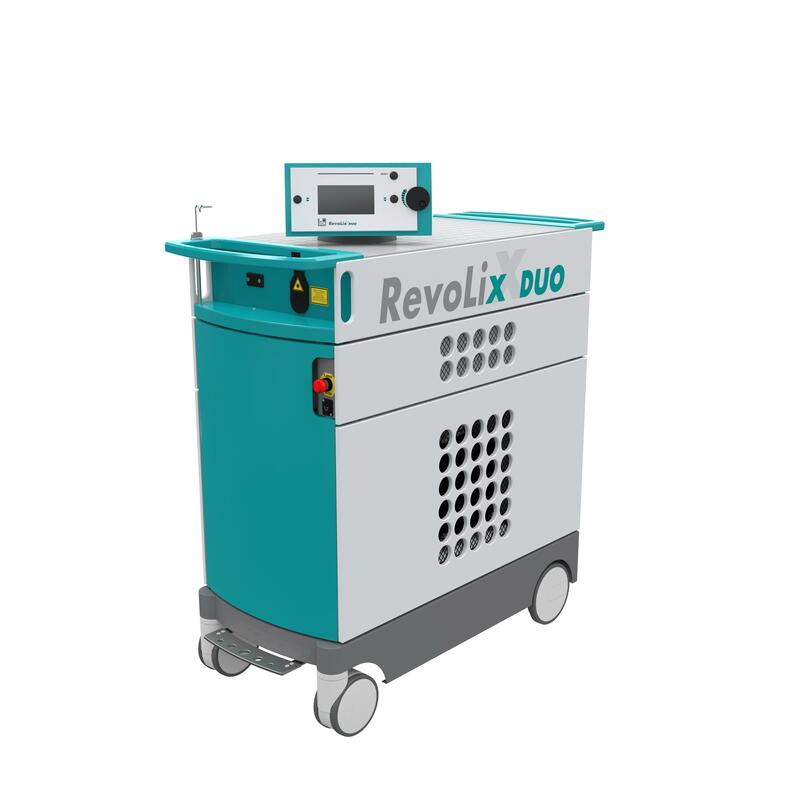 Both laser sources of the RevoLix DUO are available from the same fibre port. This feature allows using the same laser fibre for soft tissue surgery and for lithotripsy.